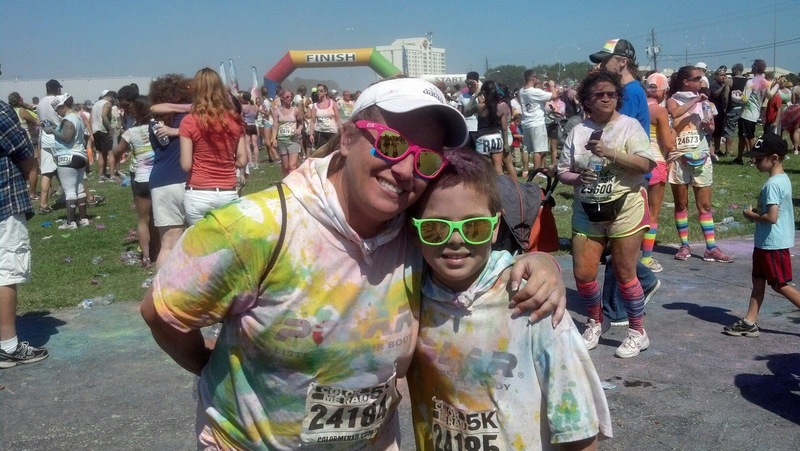 Mindy's fitness Journey: Color US Rad at Color Me Rad And CrossFit Blackbeard Week 2! 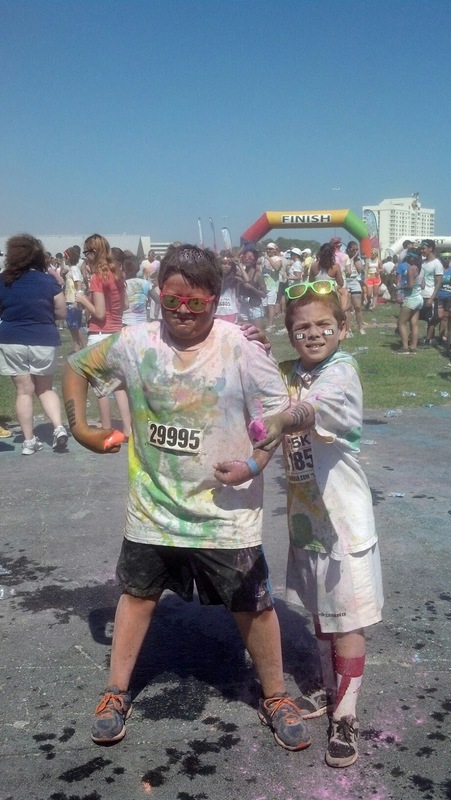 Color US Rad at Color Me Rad And CrossFit Blackbeard Week 2! 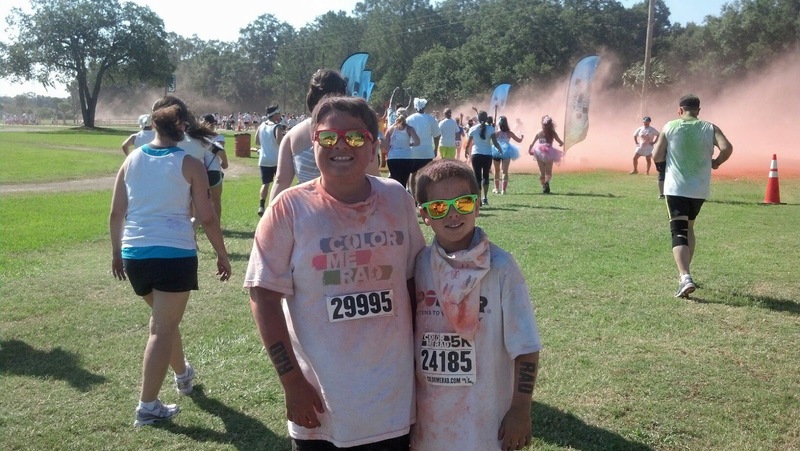 *Disclaimer: Color Me Rad provided Bryce and me with a complimentary entries to the race in exchange. All opinions are my own. Our World was a Rainbow! 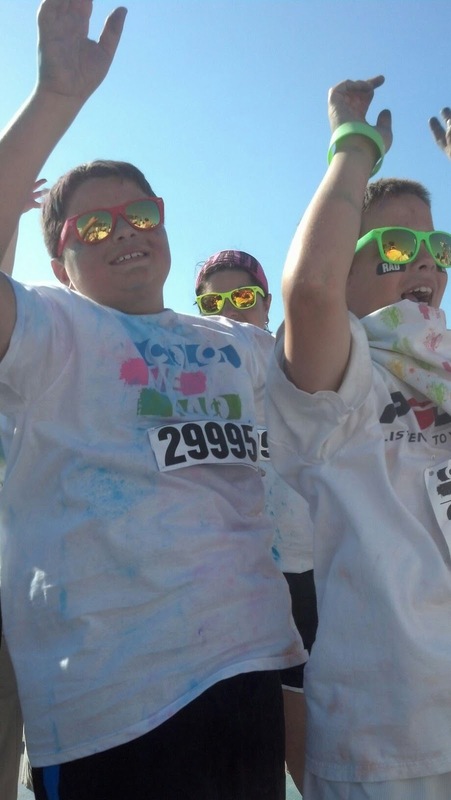 We met them before the race and Jackson and Bryce had a great time at Color Bomb stage trying to catch colors! 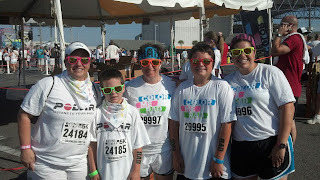 We were looking squeaky clean at the beginning of the race! What I loved about Color Me Rad is that they gave us some fun sunglasses. Amazingly enough, none of us had the same color either! Fun! We headed to the start line and the boys were doing their best to catch color bombs so that they could throw them on us (and mostly themselves!) We got a few packets and they were starting to get colorful! It was a fun party waiting for our wave to start. There was so much energy and excitement. Finally, it was the countdown to head out. Some people walked and some ran. 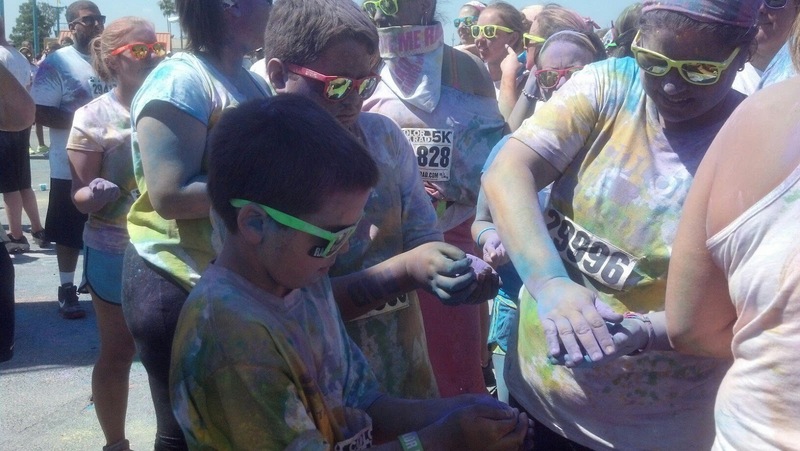 We let the boys go with Tracy, and we told them to wait for us at the first color station. Bryce loves this idea because then he runs through the station more than once while he waits for us. We started with orange. Bryce, Jackson and Tracy took off again. As we rounded a corner, I could see them in front of us and waved. Bryce was looking at me and waving, and (I am really horrible for sharing this) Bryce ran into a cone while he was waving and wiped out. I know that I should have felt bad, but it was hysterical! I wish I had it on video. He is tough as nails and popped right up and kept running... Love that tough kid!~ The next station was different. Usually the color stations are cornstarch, but this time, it was a liquid color. It was green! It felt great because at this point we were pretty warm!!! Bryce and Jackson decided that they wanted to walk. Jaymie, the boys and I let Tracy run, and we walked. We had a much needed water break, and we went through the color stations. There was a lot of laughing, a lot of silliness and a whole lot of color. We may have gone through the color stations more than once and it was ONLY because the boys wanted to... so Jaymie and I had to :) Right before the finish line we were all given a packet of color to throw when crossed the finish line. I gave mine to Bryce because he couldn't get enough! There is something about a smile under all the color that melts a mom's heart! We went back to the color stage and stayed there for quite a while dancing, catching color, and living through some serious color bombs! This race was so much fun! I cannot say it enough. This is the perfect race for people who just want to have fun. If you are someone who needs to PR no matter what, this is not the race for you... If you are someone who likes to see smiling faces and you like to escape from your troubles for a bit, this is for you! I won't miss it next time! You can bet on that! As most of you know, one of my biggest goals is to keep my son busy outside rather than inside. This run is the best way to keep him active without any complaints from him! No one I would rather have fun with!!!! This week was a lot of fun so far! I am feeling like a part of the group, and though I am definitely the person who struggles more than others, I am so proud of what's happening. 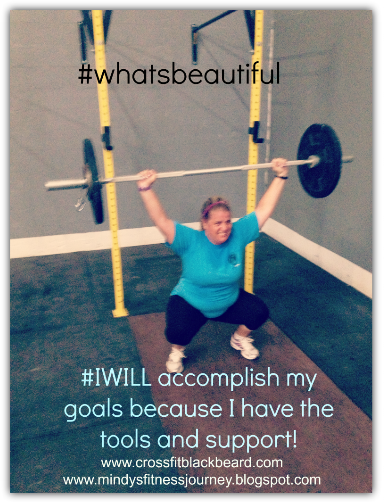 I am also so amazed by the kindness of everyone at CrossFit Blackbeard. Everyone is so supportive. They are having a special right now that is such a good price that I have to share. It ends tomorrow! It's the Get Your Friends Addicted special. One month Unlimited for $50. If you are interested, you have to sign up by tomorrow, Friday, May 31st. Tell them you are friends with Mindy. Send your email to Trey@crossfitblackbeard.com... You will love it! Please join me! It will be a lot of fun!!! I love that you and Bryce run together. You are setting such an amazing example for him. Thank you Abby! I hope so. I read that comment to him and he said, "You don't inspire me! I inspire myself. I like to run!" Makes me laugh! Glad he likes it! Runner Problem solved! HB Tune Giveaway! Do you need some Healthy Energy? Time to Jump on the Weight Loss Train!! !